Do tick collars work for cats? Do tick collars work for dogs? How long does the protection from tick collars last? Last month, I had blogged about a severe tick infestation in my home. You can read the detailed steps we took to counter this massive infestation here. The problem is a lot less severe now, because we have our dogs wearing tick collars and we are also using weekly herbal and all-natural tick control remedies. The thing is, and to be honest: we have spoiled our dogs. They sleep in our beds and you will find them on our couch, on the carpet and even on the foot-mats outside each bathroom ( and we have 3 of them!). Needless to say, the ticks were everywhere. Then, one of our friend’s dogs was hospitalized due to tick fever and he told us that the vet said there was a tick epidemic in our area! That was when I went back to tick collars, shampoos and powders. So, back to my honest opinion about tick collars. How long does it take for tick collars to work? The previous tick collar around our dogs’ neck were useless ( I had put them on in November and they were rendered ineffective by the time it was January). So, while the label of the tick collar brand stated they last for up to 7 months, my experience was that they hardly last for 2 months. As far as the question of how long it takes for tick collars to show results is concerned: the answer is Almost IMMEDIATELY. Nearly all of the ticks on my dogs’ bodies were gone. We continued spraying the bedrooms with Tea Tree oil and Apple cider vinegar solution as well as lemon water (smells great). This helped the ticks crawl out of their hiding spots and we would immediately flush them down the sink/toilet or drown them in alcohol. So, the results were pretty good- between the professional chemical pest control, the tick collars and our homemade tea tree oil and lemon spray-almost all ticks had vanished within a week. Of course new ones keep hatching but we make sure our pets are bathed with permethrin shampoos weekly, so the ones hatching on their bodies are taken care of immediately. Also, and this may be due to the collars or our other tick control efforts; the ticks that I do find on my babies are usually dead. Tick collars from the best brands are generally safe. One of my dog tends to scratch a lot once I put on a new collar on her. She seems to shown mild allergic reaction each time she is on a new collar. But this side effect is usually temporary and she is okay within a day or two. Tick collars work immediately. You will see all the ticks, fleas and lice leaving your dog’s body within a day. Adjust them to fit any size or breed. (You get special collars for cats-so do avoid using tick collars meant for dogs on cats and vice a versa). I have some best tick collars for dogs and cats reviews below to help you choose. 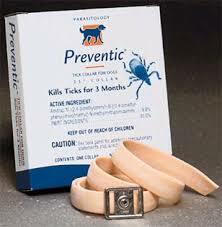 Apart from ticks, collars help prevent other parasitic infestations like mange, lice and of course, fleas. Dog tick collars are safe to use around pets (except birds, fish and bees) as well as humans. Make sure your kids wash their hands after petting the animals using tick collars. Tick collars do not last long- 2 months max is what I have seen. You might still see engorged ticks on your pets but most will be dead. Tick collars should not come in contact with water. You must remove them each time you bathe your dog. Not convenient for pets that are super active or if you live in wet areas. Dog tick collars from top brands are expensive but they may be cheaper compared to pills and spot treatments. You also need to use other tick control methods (spot treatments, sprays and powders) alongside in case of heavy infestation. This is a bestselling product for tick control on cats which has received great reviews from cat owners. It seems to work well on fleas. Seresto collar works well and within 24 hours your baby will be free of ticks and fleas! This brand of cat tick collar is known to give lasting protection for up to a year! I love all products from Virbac-especially their flea and tick shampoos. My pets do not suffer from ringworm or coat dryness which is usually the case with flea and tick shampoos from other brands. I have not tried this collar yet but plan too soon. As per reviews from other pet owners, these best dog tick collars last for almost 3 months. If ticks are a huge problem in your area, this is a must have product. It is also a lot cheaper compared to other brands. On the downside, the product smells a bit, but that definitely means it is working. This is a relatively new brand in the best tick collars for dogs. It offers 100% tick and flea protection for up to 3 months. SOZO flea collar prevents ticks, fleas and lice from reaching the dog’s head while protecting the entire body as well. It is easy to put on and adjust. For most users it lasted for a month. This seems to be a really affordable brand in the dog tick collar range. The company claims that this collar is water resistant – a blessing for swimmers! Hartz collars are reflective and bright orange in color in case your dog likes to go on night time walks. They last for about 7 months (a claim I am skeptical about). Some owners felt that the product was not effective on account of skin rashes. Also, in some dogs, the fleas and ticks only migrated to the animals’ butts. And that concludes my review of do tick collars work? I would like to hear your thoughts-so do comment below about your experience of using tick collar for dogs.